The area near the sea where Brighton and Hove meet was developed in the 1830s with characteristic bow-fronted houses. These were interrupted on the east side of Montpelier Street by the spiky gothic tower (actually at the east end) of Christ Church. It was built in 1838 at a cost of £4600 (Sawyer I p362), with a contribution from H M Wagner, for James Vaughan, one of Wagner’s curates and a popular preacher. He remained there until 1889, by when it became a district chapel. The architect was G Cheesman (ibid II p364) (identified by Sawyer as the senior of the father and son of this name (ibid)) and, in conformity with its surroundings, was stuccoed. Like other buildings by both, it showed their limited understanding of the gothic. The tower had tracery of no known pattern, heavy pinnacles and a thin spire behind a pierced parapet. The only other visible part of the exterior was the west or entrance front, with a low porch and five windows of descending size with recessed aisles. Unusually, there were no windows in the side-walls at all (1 p167). When described by Sawyer about 1880, a clerestory of almost continuous lancets had replaced plain glazed windows at each end (ICBS), but otherwise the interior was old fashioned, with galleries on three sides (ibid) and a flat plaster ceiling. As befitted Vaughan’s preaching skills, the east end centred on a tall pulpit in front of a modest communion table (ibid). 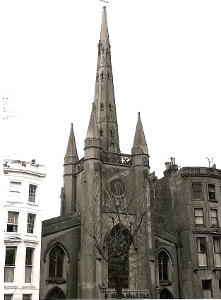 In 1886 E E Scott remodelled the interior (AR 44 p26), as he had several other early C19 churches in Brighton. Sawyer maintained that there was space for an extension to the east (I p357), but it is difficult to see where this could have been since the tower was level with the house-fronts on either side. In the event, Scott retained the existing structure, including the galleries, which received new fronts. The flat ceiling was panelled with arch-braces at the side. The table was partially separated by screens, the east wall behind it was decorated and the pulpit was replaced by a smaller one to one side. The church was burned out in 1978 and was formally declared redundant in 1981 (CCC), leading to the removal of the ruins two years later. Glass: (East window) Collins of London, c1839 (AR ibid). It is said to have been based on cartoons by Sir Joshua Reynolds, using coloured and enamelled glass. According to KI, this was removed at some date before c1950 to Bagborough, Somerset, but no such place is listed in either volume of Pevsner for that county. A reference to an east window of 1930 by Clayton and Bell (DSGW 1939) may indicate what replaced it and when.